IKE HERE, WE , NEED TO STAND TOGETHER TO HELP THIS REPUBLIC. GOD BLESS Q=17, PRESIDENT TRUMP & PATRIOTS! At Least 10 And Potentially 15 Nuclear Power Plants Are In The Path Of Hurricane Florence - Is Florence An Attack Upon America? Perhaps most alarming concerning all of the above is that the threatened US "response" and rhetoric over potential future use of chemical weapons in Idlib is dramatically escalating by the day. There is "lots of evidence" that chemical weapons are being prepared by Syrian government forces in Idlib region in northwest Syria, the new US representative for Syria said on Thursday, warning any attack on the last big rebel enclave would be a "reckless escalation." "Any offensive is to us objectionable as a reckless escalation," the envoy, Jim Jeffrey, told reporters. "There is lots of evidence that chemical weapons are being prepared." This comes days after US Ambassador to the UN Nikki Haley gave a similar warning, while also claiming to somehow predict the future, and assuring the world that "Assad is guilty" before anything actually happens. But it's hugely significant that top State Department envoy for Syria, Jim Jeffrey, actually invoked US intelligence for the first time, though not providing any evidence for the claim of Assad's supposed chemical preparations underway. It appears that should Russia continue its ongoing bombing campaign of al-Qaeda held Idlib, and should the Syrian Army ground operation commence, we are in for a likely quick escalation, with some kind of "chemical provocation" claimed by insurgents facing imminent defeat in Idlib. Landis said, "I don't know what to make of the U.S. and Russian war of words over the potential use of chemical weapons in Idlib. The final reports on the use of chemical weapons in Ghouta were not definitive." "There was no evidence found for the use of nerve agents, but controversy over the use of chlorine gas. The rebels had reason to carry out a false flag operation, as the regime and Russians suggested, but the regime refused to let U.N. inspectors in to test for chemical weapons until after a lengthy delay, which was suspicious," he concluded. 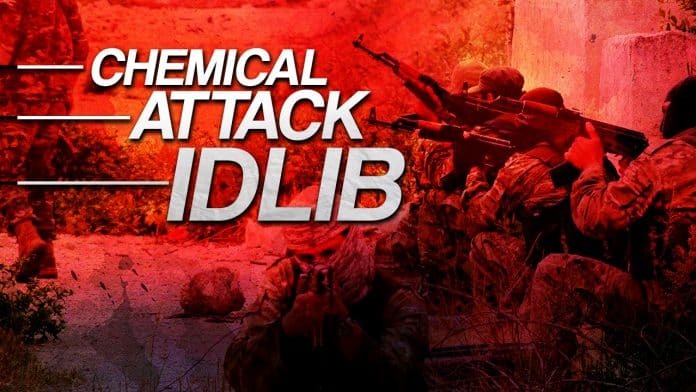 According to the information received from inhabitants of Idlib province, militants are now filming a staged provocation in the city of Jisr al-Shugur, where "chemical weapons" are depicted as being used by the Syrian army against civilians. The film crews of several Middle Eastern TV channels arrived in Jisr al-Shugur in the morning, as well as the regional affiliate of one of the main American television news networks", the Reconciliation Center said. Official Russian military sources also say two containers of a chlorine-based toxic substance have been brought to Jisr al-Shugur; however, the sources did not cite any specific intelligence or provide evidence to back the claim. The plot envisages staged scenes showing 'activists' of the Civil Defence ("White Helmets") 'helping' the residents of Jisr al-Shughur after the Syrian army allegedly used the so-called barrel bombs with poisonous substances," the center said. Speaking to reporters after a major speech on Monday, US national security advisor John Bolton slammed Moscow's allegations of an impending staged "chemical provocation," saying “That has to be, in the history of propaganda in the 20th and 21st centuries, one of the most outrageous claims that I can think of,” according to the WSJ. The FBI engaged in a systemic, strategic effort to leak information to stoke fears of Russian collusion during and after the 2016 presidential campaign, a top Republican congressman charged in a letter to Deputy Attorney General Rod Rosenstein on Monday. New documents provided to Congress raise “grave concerns” about an “apparent systemic culture of media leaking” among high-level FBI and Justice Department officials to release information damaging to President Trump, a top Republican congressman charged in a letter to Deputy Attorney General Rod Rosenstein on Monday. Two days later, Strzok wrote, “Well done, Page,” and told her that two negative articles about Page’s “namesake” would soon come out. That was an apparent reference to Carter Page, the former Trump adviser whom the FBI surveilled for months after obtaining a warrant from the Foreign Intelligence Surveillance Act (FISA) court. The FBI and DOJ declined to comment. Fox News also reached out to lawyers for Strzok and Page; they did not immediately respond to requests for comment. Page has not been charged with any wrongdoing. Heavily redacted documents have since shown that a dossier written by ex-British spy Christopher Steele and funded by the Democratic National Committee and Hillary Clinton campaign played a key role in obtaining the FISA warrant to surveil him beginning in October 2016. Strzok, who was a leading investigator in both the Hillary Clinton and Russia probes, was fired in August after the DOJ inspector general excoriated him for a slew of anti-Trump text messages he sent on his FBI-issued phone, including one in which he said “we’ll stop” Trump from becoming president. Documents also have shown that the FBI inaccurately reassured the FISA court on several instances that a Yahoo News article provided independent basis to surveil Page, when in fact it also relied on Steele as its source. The leaks involved other outlets in addition to the Washington Post, Meadows wrote. FBI and DOJ officials, including DOJ prosecutor and top Robert Mueller deputy Andrew Weissmann, met with several Associated Press reporters in April 2017, according to court filings in the Virginia federal trial of Trump’s former campaign chairman Paul Manafort. The leaks to the media continued even as FBI attorneys cited the U.S. Attorney’s Manual in telling Congress that witnesses could not answer questions about pending probes, Meadows wrote. There is “troubling evidence” that the FBI and DOJ continue to coordinate leaks to the media, Meadows said. While those disclosures may not be unauthorized, he added, they still compromise the appearance of impartiality at the bureau. Meadows concluded by requesting written communications from FBI and DOJ officials, including Stu Evans, Mike Kortan and Joe Pientka, from June 2016 to June 2017, although he emphasized that he was not suggested they engaged in wrongdoing. Congressional sources tell Fox News they expect President Trump will soon agree to a longstanding request by the House Judiciary and Intelligence Committees to declassify more documents used to justify Page’s surveillance, as well as activities by embattled DOJ attorney Bruce Ohr. Ohr had contact in 2016 with Weissmann, then his colleague, as well as other senior FBI officials about the controversial anti-Trump dossier and the individuals behind it, two sources close to the matter told Fox News. Congressional Republicans are still trying to get to the bottom of Ohr’s role in circulating the unverified Steele dossier. A Republican-authored House Intelligence Committee memo released in February said that Steele “maintained contact” with Ohr “before and after” the government fired the British ex-spy as a source. But Republicans have said the FBI failed to disclose to the FISA court not only the funding sources for Steele dossier, but also Ohr’s involvement and the fact that his wife, Nellie, had worked on Russia issues for Fusion GPS, the opposition research firm behind the dossier. The JFK assassination, the Oklahoma City Bombing, the Boston Marathon Bombing, the London Subway Bombings and the events of 9/11, nothing ever changes. The public is looking at either a massive series of cover-ups or unwarranted secrecy with regard to the evidence leading to each crime. Once again, I am addressing this heinous conspiracy on behalf of the approximately 3,000 grieving families as well as the American people that deserves to be told the truth. I have serious doubts about the validity of the findings of the 9/11 Commission. The findings are neither complete nor completely believable in their present form. Here is a brief and partial summary of my continued unanswered questions related to 9/11 that I want answered. 1. Why was the video of the Mineta testimony removed from the 9/11 Commission website? 2. Why has not the government addressed the “coincidence” of Able Danger? It is a case of a terror drill providing plausible deniability for the terror act embedded within the drill. 3. What explains the failure of the Government to release the many videotapes of the plane, on approach, that struck the Pentagon? It is almost 2 decades later, where are the tapes? 4. Why was there a change in the scramble/intercept procedure three months prior to 9/11 for jets that are off course accompanied by a change in the shoot down orders? 5. What can explain the failure of the government to scramble jets over a period of an hour and twenty eight minutes between the Twin Towers being struck and the crash in Pennsylvania? With this kind of air security, Somalia could successfully invade the United States. 6. How could the unrelated events of 9/11 and the invasion of Iraq be successfully linked which culminated in the demise of Saddam Hussein despite strong evidence to the contrary? 7. What explains the well documented (e.g., Kevin Phillips) Bush/Cheney plans to invade both Afghanistan and Iraq within the first 10 days of the Bush Administration. This was well in advance of 9/11? However, 9/11 was used as the excuse in the early days of our military action to justify these unwarranted invasion. Why wasn’t this contradiction investigated? 8. The well documented engineering and architectural arguments which, in my mind clearly demonstrate that the fire and heat generated by the planes striking the Twin Towers were insufficient to melt the core of the buildings. Why doesn’t this evidence support the 911 Commission findings? Why hasn’t a Congressional investigation looked into this striking discrepancy? 9. What could explain the almost near free-fall collapse of all three towers which defies the official explanation? Never before in the history of engineering and planes crashing into buildings has a building come down in such a free-fall and symmetrical manner? 10. Where are the pieces of plane wings that supposedly struck light poles on its approach to the Pentagon? Shouldn’t independent investigators be able to examine these wings to determine the authenticity of the 9/11 report on this topic. The trust me approach did not fly in 2001 and it damn sure doesn’t in 2016. 11. The attack upon the Pentagon appears to any layman who looks at this evidence to look more like a missile strike than an airplane crash. Why does the circumference of the hole in the Pentagon greatly differ from the width of the plane? Why is there an exit hole on the backside of the building since the plane melted upon impact? Where is the debris field that one would expect on the backside of the building? 12. What about the pop outs we see on each floor of the WTC buildings before the collapse? How could this not be considered to be a controlled demolition? 13. Where are the skid marks on the lawn prior to impact at the Pentagon that would have been left by the plane which supposedly struck the Pentagon? 14. What about the evidence which strongly suggests that 11 nations warned the United States about the possibility of such an attack? 15. Maintenance worker, William Rodriguez, was the last man out of the Twin Towers. At 8:46AM, Rodriguez reports that he heard two distinct explosions, seven seconds apart, which emanated from the floors below him. Rodriguez also reports the two explosions occurred before the planes hit the towers. Rodriguez was interviewed by the 911 Commission for 30 minutes, in secret, behind closed doors. His testimony is conspicuously absent from the 9/11 Report. So why did the last man out of the Towers manage to have testimony left out of the 9/11 Commission Report? 16. Brigham Young University professor, Steve Jones, concluded that super thermite was used to bring down the Towers, including Tower 7, through a controlled demolition. Jones contends that he was warned by governmental officials that if he published his results his personal “pain would be great.” And the warning proved prophetic as Jones was fired his job as a professor after publishing his results. How does a tenured university professor get fired for publishing legitimate research results when the peer review process could have been utilized to analyze and discredit the Jones’ claims? Why isn’t the government standard for research held to the same level as demonstrated by Professor Jones? 17. Ground Zero rescue worker, Mike Bellone, claims he was approached by unknown FBI agents a short time after he and his partner, Nicholas DeMasi, a retired New York firefighter, found three of the four “black boxes” among the WTC rubble before January 2002. In the 9/11 Commission Report, Chapter 1, footnote 76, there is the sole but definitive reference to the airline “black boxes”: “The CVR’s and the FDR’s.” [voice and flight data recorders] from American 11 and United 175 were not found.” With this obvious contradiction, why weren’t these two rescue workers interviewed by the 911 Commission? 18. How could all four black boxes not be retrieved by the FBI when nearly ALL crashes through course of modern aviation history, do retrieve the black box? 19. When LBJ ordered JFK’s presidential limousine stripped and cleaned, he effectively destroyed the primary crime scene in the murder of JFK and implicated himself as a co-conspirator in the murder. In similar fashion, forty one truck loads of debris were hauled away from Twin Towers within hours of the crime and not one piece of the evidence was analyzed as a crime scene. Isn’t this obstruction of justice? Who ordered this illegal action to take place and why? Both events are felonies as they clearly represent the tampering of a crime scene. Why didn’t the 911 Commission Report address the question as to why normal crime scene investigative techniques were not employed? 20. Much of the remaining crime scene evidence is still being held under lock and key at Hangar 17 at JFK Airport. nearly 2 decades later and with the ink dry on the 911 Commission’s findings, why isn’t the evidence made available to journalists and investigators? What is the government afraid of? An earlier generation knew that the government was lying about JFK’s murder, but did little to force the truth out into the open. I refuse to capitulate to the same kind of arrogance and the possible underlying motives of key government agencies with regard to the events of 9/11. Until these twenty questions, and any other pertinent questions are answered, to the satisfaction of the victims’ grieving loved ones, I will never let go of this issue and neither should the citizens of this country. We have a solemn duty to the dead and their loved ones to discover the real truth about the events of that fateful day. Also, let’s not forget that we lost our individual liberties on that fateful day as well. A more important question might be, what false flag event will be employed to stop the 2018 midterm elections? Still Think 'Weather Modification' Is A 'Conspiracy Theory'? You Won't After Reading This! With Hurricane Florence now taking aim at South and North Carolina and much of the East coast and several more tropical systems now brewing in the Atlantic Ocean, it's time to talk about hurricane preparation while also taking a good look at what some are thinking but few are saying, might Hurricane Florence be the result of weather modification and could Florence be an attack upon America? 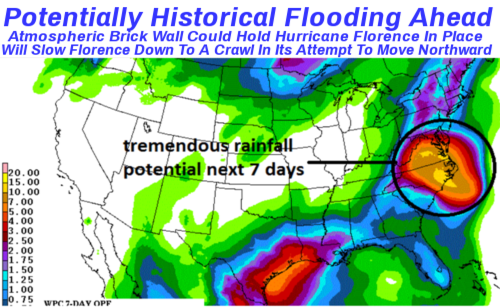 And could the fact that Florence may soon stall just off of the East coast for 60 hours or more, potentially delivering record amounts of rain to large parts of the East coast, be the results of weather warfare? While the #FakeNews pushing mainstream media here in the US still refuses to recognize weather modification and weather warfare for the reality that they are, then-US Vice President Lyndon Johnson back in 1962 gave a graduation address at his alma mater Southwest Texas State University, now known as Texas State, and as we hear from the lips of Johnson himself in the 2nd video at the bottom of this story, "he who controls the weather will control the world". “Control of space means control of the world,” Johnson declared. From space, the masters of infinity would have the power to control the earth’s weather, to cause drought and flood, to change the tides and raise the levels of the sea, to divert the gulf stream and change temperate climates to frigid. Yet despite the admission 50+ years ago by the US Vice President, any talk of weather modification or weather warfare immediately gets lumped into the category of 'tinfoil hat conspiracy theory', despite the US military using weather warfare itself back in the Vietnam War during Operation Popeye. And as we see from this Wikipedia entry on Operation Popeye, they tried to cover that up, too! So why are the mainstream media and the globalists so reluctant to admit that weather warfare exists despite this 1996 US Air Force document titled "Weather As A Force Multiplier: Owning The Weather In 2025"? We'd venture to bet it's because they intend to use it against us, and with evidence that the hurricane's of 2017 were also weaponized against America after President Trump had bowed out of the Paris Climate change agreement we have to ask, how many HAARP facilities do the globalists control? If you're still a weather warfare skeptic, you can see the US Air Force "Owning The Weather" document embedded in full at the bottom of this story. And while the MSM will continue to push the 'weather modification is a conspiracy theory' lie, as we had reported on ANP back on April 24th, the nation of China is in the process of building the biggest rain-making system in the world, 3 times as big as the entire nation of Spain! And while we don't have absolute proof this moment that Hurricane Florence has been engineered to cause maximum damage, we do have absolute proof that weather modification is now a reality. Add that to the fact that President Trump's America is seemingly 'public enemy #1' in the globalists eyes hints they'd love to have a secret way at getting back at him and us so, what better way to do so than to engineer a massive weather event that nobody could ever tie back to them? Well Steve Quayle warned us in his book "Weather Wars & Un-Natural Disasters" several years ago that “Technology will make available, to the leaders of the major nations, techniques for conducting secret warfare, of which only a bare minimum of security forces need be appraised… Techniques of weather modification could be employed to produce prolonged periods of drought or storm." 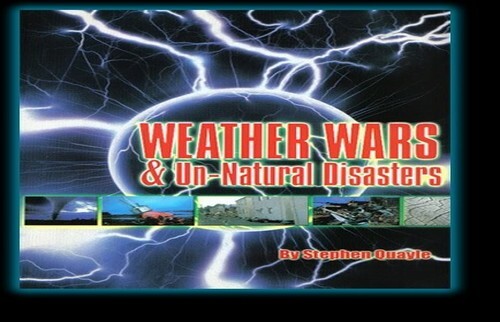 We also can't forget to visit Dane Wigington's website and his extensive list of weather modification patents going back to the early 1900's proving man has been attempting to 'play God' with the weather for a very long time. With four states having already declared a 'state of emergency' and residents close to the ocean already being evacuated, governor's and emergency management agencies are already telling people to prepare for the worst with Florence strengthening to a CAT 4 at this moment and barreling straight for the coast. Yet rather than this being a 'normal' hurricane that rips through the Carolina's, into Virginia and up through Maryland and the mid-Atlantic, Perspecta Weather reported Monday morning that an 'atmospheric brick wall' has set up over the Northern Atlantic Ocean, potentially keeping what may soon be a killer hurricane from moving northwards, potentially holding the mass of wind and rain in the same place for up to 60 hours or more. And as we see in the next image below taken from their story, that potentially means huge amounts of rain for many areas that are already close to sea level, with 20' storm surges also supposed to be delivered. And as we also see in the next image below, there are at least 10 and potentially 15 nuclear power plants also in the 'line of fire' of Florence as we also see and hear in the final video below. And should Florence stall off the coast of North Carolina as it is suspected to do, delivering huge amounts of rain for days along with potentially 20' storm surges according to this story from Weather Underground, the lower lying plants could be flooded. 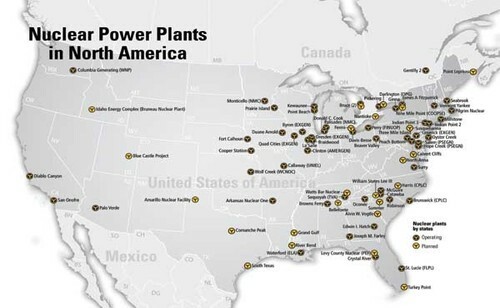 And the Brunswick nuclear power plant near Southport, North Carolina, might be one that is in the greatest danger being almost directly on the coast, surrounded by wetlands and woodlands, and one of the oldest nuclear power plants in the country that opened back in 1975. Also sitting by the Cape Fear River, the power plant sits at the height of just 20' above sea level and is less than 2 miles away from the Atlantic Ocean. With that region potentially getting 10 to 15" of rain over several days combined with a 15 to 20' storm surge, it is quite possible that a nuclear power plant or two here in the US could soon be under water. And should that happen, might we see something similar to what Fukushima, Japan experienced in 2011? So with Florence baring down and potentially millions of Americans in its path, we turn our attention for the closing of this story towards hurricane preparation, something that we hope that everybody in its potential path has already done because you are quickly running out of time. And we're not the least bit surprised that stores in areas where Florence might soon be clobbering have already run out of food and water as CBS reports in this story that the Drudge Report linked to Monday morning. How often do we hear of stores running out of food and supplies days ahead of potential catastrophe's? Giving us just one more reason to prepare far ahead of time, stores running out of food and stock 3 or 4 days before 'the event' also proves to us just how fragile our 'just in time' system is and how quickly it could be brought to a sudden end should any number of different worst case scenarios suddenly arrive. In this new story over at Ready Nutrition that was republished over at Zero Hedge, Lisa Egan gives us 5 likely hurricane scenarios to prepare for in which she warns that one of the most important things we can do should a hurricane visit our neighborhood is be prepared to change our plans. Warning that hurricanes are incredibly unpredictable and can shift direction at a moments notice, thus making one area that seemed safe suddenly in the line of fire, their story also reminded us, if we're in its path, don't think the government is going to save us. So we invite you to please share any hurricane prepping tips that you might have in the comment section below, especially to those who've lived through such disasters in Florida or Texas, your tips might save lives. At seemingly every turn when I research a multitude of potential threats against the United States, I find the Chinese at the bottom of virtually every threat. It is becoming clear that China is close to completing its plans to occupy key areas as a precursor to invade the United States. This article is the first part of a two part series on this subject. The Communist Chinese have made tremendous progress in positioning themselves to not only control much of our shipping lanes, but they have also positioned themselves for invasion in combination with virtually all of Latin America. The Chinese are making tremendous military inroads into Central America in places like Mexico with the construction of warm water ports. However, as the readers will soon see, the Chinese maritime expansion incorporates several key waterways around the world, but the most dangerous expansions serve to threaten the national security interests of the United States. The Chinese are expanding their control over the world’s waterways to the point where it constitutes a clear and present danger to the United States. The Port Authority of San Antonio has been working actively with the Communist Chinese to open and develop NAFTA shipping ports in Mexico. What Dr. Corsi said 12 years ago has come to fruition but you can also include much of California as well (eg Stockton and Sacramento). The unspoken message here is that the Chinese will not be offloading just product, there will also be the offloading of troops, mostly covert in the near-term. In 2016, I authored a report based upon a leaked seven-pronged invasion plan of the United States and the attack would originate from our Southern border. The information originally came to me from a source formerly associated with the Naval War College. This was the first part of a two part series on the topic. According to my sources, when Russian led and backed forces attack the United States, the attack will come as the result of a six-pronged strategy. 4. In a secondary and delayed attack, Chinese forces embedded in American ports (e.g. Long Beach), who have entered the country in cargo ships, will be unleashed to attack key military bases in California. At the same time, Chinese soldiers, who are embedded in the Sierra Madras will join forces with the Latin American forces as they sweep northward through Mexico and will dramatically burst through the border and then fan out to the north, west and east. 5. The fifth part of this attack, the Fifth Column, will be carried out by terrorists (eg MS-13) who have already gained entrance into the United States. 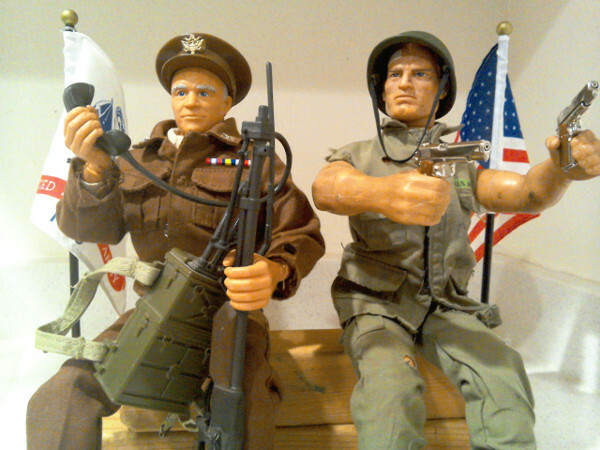 Key assassinations and critical infrastructure sabotage will be carried out by these forces. Phase two was the topic of The Last Ship. In the show, South America unifies with part of Central America and attacks the main part of the US naval fleet, in Florida, and virtually destroys it. The trigger event is predicated on the assassination of the Panamanian President and the subsequent framing of the United States for the assassination. In another disturbing development in the Southern Hemisphere, I previously detailed how Russia had formed military alliances with much of Central and South America. This would be a necessary prerequisite to any invasion, Red Dawn style.This scenario is very valid as it represents what I previously wrote when I spoke of the tremendous expansion of Russian military alliances in the region as well as the Russian supply of military equipment. 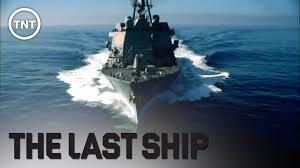 There are so many potential parallels between the season premiere of the The Last Ship and the overwhelmingly dangerous threat posed to all American which lies south of our border. America has two continents organizing against it at the same time. The real possibility of an emerging pandemic poses a threat as well. In the opening scene of The Last Ship episode season premier, a lecture is given at the Naval Academy on how war begins. As Mark Twain once said, “History may not repeat, but it sure does rhyme. [*]Athens and Sparta began their monumental war in the midst of a plague. [*]The Peloponnesian War also began in the midst of a plague. MORPHED INTEGRATED WEATHER MICROWAVE ENERGY ,REAL TIME MAP HURRICANE TRAJECTORY, DOES NOT FOLLOW THE SO CALLED CONE MODELS...AND MASSIVE ENERGY WEAPON CONSTRUCTS AND FLASHES FROM DIFFERENT AREAS ARE ENHANCING , STRENGHTENING , AND STEERING THESE STORMS. As tensions rise over Russian assistance in the Syrian liberation of Idlib strong verbiage from both Super Powers is found in Both Russian and US media. The danger of course is that President Putin has stated before if he is losing a ground war he will resort to Nuclear Force.